My keys crack snappity snap as I whack mackity mick mac. I'm Barack, I'll talk whack smack, and pop cap cappity caps. Last night, my roommate and I were out for our bi-weekly/monthly food shopping trip, when we noticed this interesting new product next to the orange juices. 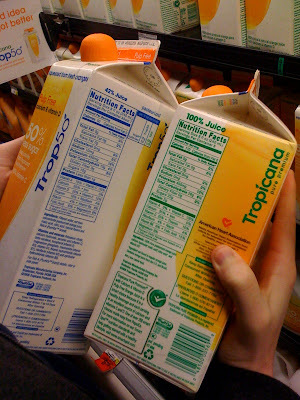 Normally, we simply go for the 128oz Tropicana OJ, but today we saw something new. Now, as everyone is well aware of, Tropicana has been going through a change lately (insert puberty/fruit related joke here). To tell you the truth, I like the new look. It's clean, simple, and honestly, if the woman in that picture was missing a tooth, you could use the same image in a 40oz ad. But I digress. Tropicana obviously wants to get in on this whole "health" craze (because everyone knows how unhealthy orange juice is), so they have come out with Trop50, which touts 50% less sugar and calories than normal orange juice (or what will now be known as what fatties drink). Wow! This is an amazing breakthrough in juice making technology! I was excited to learn that they had finally made juice healthy. All these years I've been good, drinking nothing but sodas and beers, but every now and then, I admit that I cheated and had some juice. I'm not proud. So to get back to my story, I reach for the carton and find the nutrition facts. Fact No. 1: This juice did have 50% less sugar and calories than what the fatties drink. Fact No. 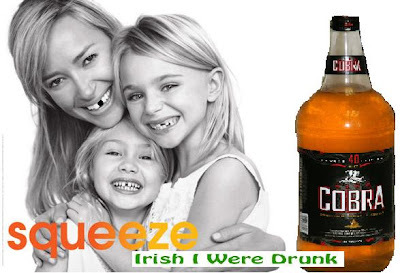 2: This juice was only 42% juice. Wait what? Are you serious? To give the drink 50% less sugar and calories, they just replaced more than 50% of the juice with sugar water? Remember when you used to add water to that last bit of milk just so you could have a full bowl? Congratulations, you invented Milk50! Million dollars right there.